SPI International / FILMBOX has acquired rights to a new ten-episode epic story of the Knights Templars Knightfall from A+E Studios, the production unit of the award-­winning global media company A+E Networks®, as well as the new German smash-hit crime series Einstein from Red Arrow International. The global TV operator announced both series will air on FilmBox movie channels across Eastern Europe and in several other territories as SPI continues its worldwide expansion. Developed by HISTORY, and produced by A+E Studios in association with The Combine and Midnight Radio, Knightfall is a new, epic scripted series from executive producers Dominique Minghella (Doc Martin, Robin Hood), Don Handfield (Touchback, The Founder, Kill the Messenger), Richard Rayner (L.A. Without A Map) and Oscar® and Golden Globe® nominee Jeremy Renner (American Hustle, The Hurt Locker). Knightfall chronicles the mysterious but true accounts of the Knights Templar, the elite warriors of the Crusades. Tom Cullen (Downton Abbey) stars as Landry. Knightfall will come to FilmBox channels in 2018 in the following markets: Poland, Czech Rep., Slovakia, Hungary, Romania, Bulgaria, Albania and ex-Yugo. The Knights Templar were the most powerful, wealthy and mysterious military order of the Middle Ages, entrusted with protecting the Holy Grail and harboring secrets capable of destroying the Church itself. Knightfall goes deep into the inner sanctum of the clandestine world of this legendary brotherhood of warrior monks. From their battles in the Holy Land, to their clashes with both the King of France and Pope Boniface VIII, to the betrayal that would ultimately lead to their tragic dissolution on Friday the 13th — a date which became synonymous with bad luck — the story of the Knights Templar has never been fully told until now. Knightfall takes you inside the world to find out who these knights were, how they lived, and what they died believing. FilmBox viewers will also get to enjoy the fast-paced, fun crime series Einstein about a young and brilliant university professor accused of the theft and abuse of illicit stimulants – until the police offer him an extraordinary deal: if he agrees to help them solve crimes, he won’t have to serve a prison sentence. And the protagonist is none other than the great-grandson of Albert Einstein. The ten-episode show starring Tom Beck will premiere on FilmBox channels in the fall. Einstein is produced by Zeitsprung Pictures and distributed worldwide by Red Arrow International. “We have been focusing on worldwide expansion of our distribution footprint and we are fully committed to bringing more exclusive content to our channels across all the markets,” said Berk Uziyel, executive director for SPI International / FILMBOX. “We are happy to bring to our viewers Knightfall, an excellent series which shows both the history and the legend of the Templars. We are also excited to have acquired Einstein as it offers an innovative approach to the crime format and which appeals to younger audiences,” Mr. Uziyel added. “We are extremely excited to cement our partnership with FILMBOX with a show like Knightfall. We know their audience will love the characters and storytelling,” said Marica Giessen, Senior Sales Manager, EMEA for A+E Networks. SPI International / FILMBOX has acquired multi territory rights to the new Steven Seagal cutting edge 12 episodes TV Series General Commander. The series will start filming in Europe and Asia in September 2017 and is expected to premiere on FilmBox channels in 2018. Loni Farhi and SPI will act as co-producer to the series. SPI entered into a multi territory agreement for Africa, Eastern Europe, CIS, the Baltics, ex-Yugo, Latin America, Portugal, Turkey, and the Middle East. General Commander is a new, international action TV series starring Steven Seagal to be produced by Saradan Media and written by Bey Logan/Phillipe Martinez. The series follows the missions and intrigues of a top secret, rogue, international paramilitary unit created to hunt and fight major criminal organizations in order to stop the momentum leading toward World War III. “SPI is thrilled to co-produce General Commander and bring this action-packed series to FilmBox viewers. We have been expanding distribution of the FilmBox movie channel in the CIS, the Baltics, Middle East, Turkey, Africa and across CEE. We are now gathering content to launch FilmBox and FilmBox Action in Latin America, India and across other markets,” said Loni Farhi, President of SPI International. “Co productions like General Commander and high level content acquisitions are clearly showing our commitment to our channels and the new markets that we are entering,” Mr. Farhi added. SPI International / FILMBOX is launching FightBox HD channel with Discover Digital, a digital media company in South Africa. FightBox HD is a hard-hitting, action-packed 24/7 combat sports channel which presents multiple martial arts disciplines as well as live MMA and kickboxing events from Europe and the U.S. Discover Digital offers the channel on its IPTV service which debuted in South Africa this month. The new Digital Entertainment on Demand (DEOD) service will enable Discover Digital to partner with regional telecommunications operators, both in the domestic market and in other African countries. FightBox HD is one of several thematic channels which SPI International distributes in Africa. The other channels which are already being carried by numerous platforms and operators across the continent include: FunBox UHD, FilmBox Africa HD, FilmBox Action HD, FashionBox HD, DocuBox HD, Fast&FunBox HD, FilmBox Art House, 360TuneBox and Gametoon. “As mobile and fixed line operators enter the media industry offering OTT & VOD services, SPI is extremely happy to collaborate with a professional business partner like Discover Digital in order to feed operators with the FilmBox TV channels and its exciting VOD content,” said Amit Karni, SPI's Head of Distribution, Africa. SPI International has launched FUNBOX UHD on Vodafone TV in Spain. World’s first global TV channel with native Ultra HD content is now available to Vodafone TV viewers. 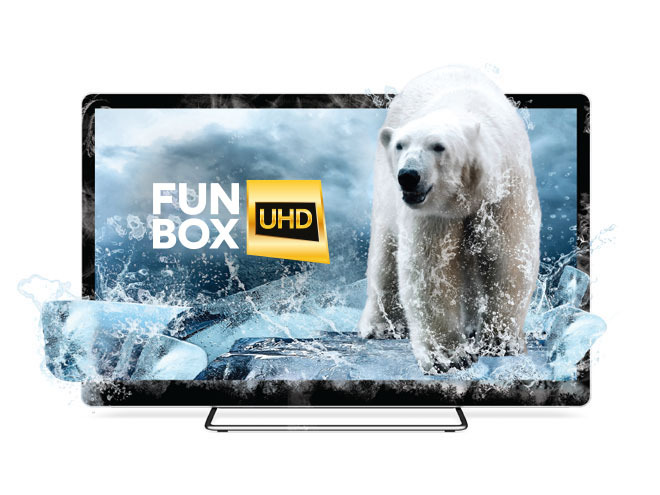 FUNBOX UHD - the global general entertainment channel carries a mix of native Ultra HD documentaries, performing arts programming, extreme adventure / lifestyle content as well as movies and TV series. The channel presents highly acclaimed programs such as cinematic opera La Boheme and The Sea Chef – hosted by two Michelin-starred chef Ángel León around the Spanish coast. “SPI is focusing on making as much native Ultra HD content as possible available via this channel, and we are only showing those programs that have a high production value and can deliver outstanding visual highlights for the viewers,” said Raymond Van Der Vliet, Director of Distribution in Western Europe for SPI International. FUNBOX UHD is currently available on a number of DTH platforms, IPTVs and OTT services in Portugal, Germany, Turkey, Luxembourg, Romania, the Netherlands and Qatar.